A MyArtsLab “Closer Look” interactive feature. The online homework system she was referring to is MyArtsLab, and because of it, I am confident that all of my students do, in fact, use their textbook (Stokstad and Cothren’s Art History survey textbook) in my classes. With the beginning of this school year, I am using MyArtsLab for the third semester in a row for my two sections of an Art History survey course, from Renaissance to Modern art. It provides students with interactive assignments deriving from and expanding beyond the textbook itself, along with tests and quizzes, writing assignments, flashcards, and an (optional) e-text with an audio option. It can be connected to Blackboard and other learning management systems, and it provides a digital platform that instructors can tailor to their teaching and their students’ needs and abilities. I teach at a small, open-enrollment, liberal-arts branch of a research university. Some of my students really love MyArtsLab (one of them even commented on my Student Evaluations last semester, “I learned better with using MyArtsLab.”). So far, none of them have told me that they hate it! It also works well for me as an instructor, most of the time. It’s not without its faults, but I find that the benefits in terms of student learning and engagement outweigh the frustrations that we sometimes experience with it. I assign homework on MyArtsLab for every class. With these assignments, students are prepared to discuss something about the material in every class. Maybe not all of it, but we’ve at least got somewhere to start. 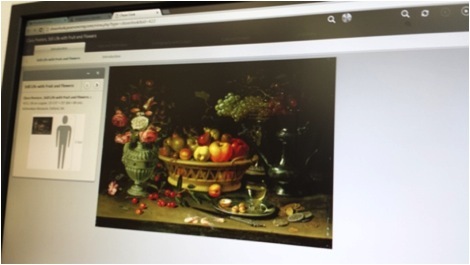 A lot of the assignments use the “Closer Look” features, which are annotated, narrated, in-depth analyses of specific works of art that are featured in the textbook. Much of the material, although not all, replicates what is stated in the book about the work. Because it is narrated with audio, and the animations show the students exactly where to look in the work for the concept or meaning, the content is easier for the students to grapple with, and they enjoy the “reading” process more. Another type of assignment which I use regularly introduces the students to short excerpts from primary texts related to the art objects. This allows me to incorporate more of such sources into the survey experience than I, as a specialist in a very tiny subfield of the expansive scope of a survey course, could manage otherwise without many more years of teaching experience under my belt. I particularly appreciate how easy it is to use these and all the other ready-made assignments, so that I can focus each semester on refining my own teaching and the parts of the course that I want to customize. 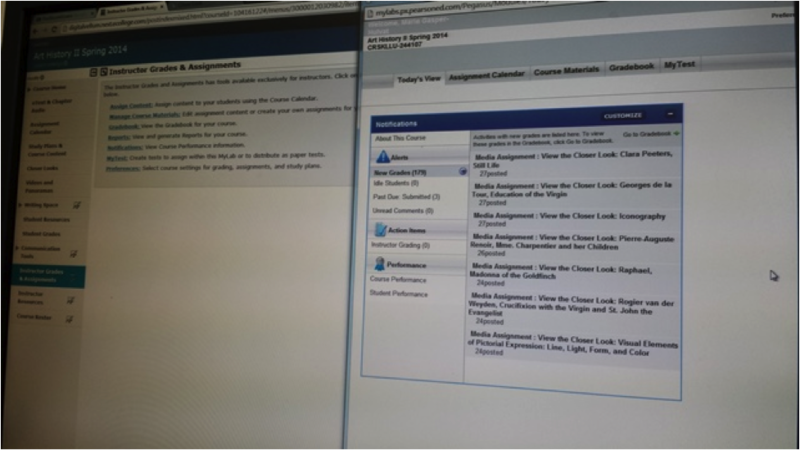 With the assignment calendar feature, I can easily drag and drop assignments onto the appropriate days, which is much faster than assigning content with due dates in a system like Blackboard, at least with my limited expertise in both systems. This makes it easy for students to do their homework and easy for professors to assign and grade homework. One of the nicest aspects of MyArtsLab is that you don’t have to reinvent the wheel, but you do have full abilities to tweak the wheel as much as you want or have time for. However, with that being said, it is far from a perfect wheel. For example, when I went in to create the new course for this fall semester and place all the homework assignments on the calendar, I discovered that I could no longer see in my Spring 2014 course which assignments had been assigned for which days. This is the result of some sort of overhaul of the system over the summer, and I later found where I could see the information from the previous course, but it definitely resulted in some consternation. This is a system that is definitely still in development. In some ways that is a benefit, because it gives the opportunity to make suggestions and help in the formation of the system, and the editors have been overwhelmingly welcoming to feedback when I’ve given it. But it can be frustrating for the students when they find typos and errors in the homework. And every now and then an inconsistency pops up; for example, the default “out of” grading value is 1 for most assignments, but for one particular chapter it was “out of 100” for all the instructor-graded assignments. The first time we discovered that was also a bit frustrating to the students who had given excellent answers and found themselves with a grade of 1% rather than 100%, until I fixed it! Additionally, the fact that some of the features in MyArtsLab do not always work on tablets can be frustrating to students. This is almost exclusively a problem with the “Architectural Panorama” features that provide links to external websites which are not developed by the publisher. Overall, MyArtsLab has a bit of a clunky interface, which is not always intuitive for users. With students who are familiar with websites, aps, and video games which provide a much more streamlined and elegant user experience, MyArtsLab can feel a bit behind the times in its look and feel. I can imagine how it will eventually be developed to have a smoother, more up-to-date interface, but at this point I’m personally glad that most of the development of the tool seems to have focused upon the content rather than the appearance. When choosing to use MyArtsLab, I am asking my students to make a significant financial commitment to their course (beyond tuition, of course). New Art History textbooks come with access codes for the system, but used textbooks do not. Alternatively, students can purchase access to the online system only for $55, or for the system plus the e-text for $75, at least for this semester. I do not take that investment lightly, but I also believe that it is worth the value for the product they purchase. And because they invest money in it, they have a greater personal investment in making use of it – particularly if I guide them as to how to make good use of it through assignments and suggestions for studying. One of the nicest features about the system is that students can register for 14-day free temporary access which allows them to try out the system and my course before committing to the purchase. Honestly, if the free temporary access were not available, I probably would not use it. Ultimately, it’s not a perfect system, although nothing ever is. If I had twenty, or even ten, more years of experience teaching survey courses, I might not choose to use it, because I might have developed comparable materials to my satisfaction. But my students need good content and engaging means of learning it in their homework tonight. MyArtsLab gives a very good option for providing that for them. This lukewarm response may not be the enthusiastic review that Pearson, the publisher, would like to hear about their product (and to be clear, I did not inform Pearson that I was writing this review, nor did they contact me in any way to ask me to write it), but for now, I am of the opinion that MyArtsLab is good enough. And I am hopeful that with time, it will continue to improve. I certainly reserve the right to change my mind on this, particularly if it doesn’t continue to improve. And perhaps, in a year or two, I will decide that it no longer is good enough. There is certainly room in the online market for a better product, but for now, this is the best tool I have found for consistently keeping students engaged outside of class. With MyArtsLab at home, when we are in the classroom, we can all be more engaged as well. It would be really fantastic and amazing if some of us involved here on AHTR could create together a free, open-source comparable system. That feels like such a daunting task, though. Perhaps something to consider for the next CAA THATCamp? I feel so completely overwhelmed with the tech aspects of such an endeavor, not to mention the content aspect. Within the past year, I did an item by item review of the material in Pearson’s MyArtsLab, and I was surprised to find that MOST of the material was open source. Pearson is just providing url links. It can be reconstructed, and improved with crowd-sourcing. That’s the type of resource that would be a great foundation for starting an improved and truly free, open source “lab”–are you willing to share your review, Janice? We’d love to post it! I didn’t write the review up, Michelle. It was purely for myself. I didn’t want to assign MyArtsLab to students without getting to know it myself. A colleague of mine told me that she assigned MyArtsLab because she was really impressed with two or three resources. I showed her that she didn’t need to go through Pearson to get to those sources. That didn’t stop her from assigning MyArtsLab to her students, because she wanted to be able to direct them to one place where ALL of the resources outside of the text could be found. Above and beyond making these resources accessible outside of Pearson’s paywall, I wonder if it would be possible to do it in a way that allows individual instructors to pick and choose, and construct “collections” of resources specific to their courses. I didn’t write up the review, Michelle. I just looked for myself at the material in the MyArtsLab, because I didn’t want to assign something I wasn’t familiar with. Such a good idea, Marie. The site upgrade, new lesson plans etc were funded by a Kress Digital Resources Grant. I wonder if it would be possible to apply for another to fund this, or to pair with a really great existing resource like Smarthistory to use some of their resources and augment with questions, quizzes etc using such a Kress grant….. Thanks for pointing out the quizzes on Khan Academy Ginger – which are a really great resource (thanks in part to all your hard work!). FYI, there are now close to 200 short quizzes on art history objects and styles on Khan Academy – and we’re working on augmenting and improving these this semester, and adding quizzes that will work like flashcards. Khan Academy (a not-for-profit w/a commitment to totally free education, now being translated into dozens of languages) now has quizzes, and we’re expanding and improving what’s there, and we are partnering with major museums (British Museum, Getty,Tate, Asian Art Museum and others soon to come), organizing their content into learning tutorials in a partner area, and bringing the relevant content (articles and videos) into the “core” art history area (we just did this with a ton of amazing content from The British Museum). This is one of the ways in which I am hoping that AHTR can be an asset to art history instructors – the sharing of the similar ideas and materials that are behind that paywall at Pearson. It’s great to be able to direct students to a single place where the resources for a given course can be accessed. But I also want to be able to pick and choose and tailor the resources to my course. It would be great if instructors could do that and create “collections” specific to their courses. Just a suggestion. That’s actually one of the things I like most about myartslab–I can pick from a variety of assignments and activities to focus my students on what I want them to learn. I can also give them a variety of types of assignments to keep things from getting too predictable and boring. This sort of functionality definitely would need to be part of an free system as well. And I totally agree with you, the content of myartslab is absolutely available elsewhere for free — what is not, though, as far as I know, is the kind of interactivity coupled with the relatively easy-to-use grading system that myartslab provides, and that is what makes it more engaging for students and helps me save time so that I can work on making their classroom experience more engaging as well. Marie, what a fabulous idea to create a free, open-source, online resource like MyArtsLab, that would be flexible enough so that faculty could pick/choose what they want, and customize it for any class. It does sound like a daunting task, but if we could get enough people interested and start brainstorming, it could be done. If you go forward with this idea, count me in, I’d love to be part of the project. And if it was a “template” type resource, where it could work for survey, world art or any class, a sort-of drag-and-drop process, something like this could be very valuable. I think what feels most daunting to me is the programming parts of such an endeavor. Content is something that I think could be managed and crowd-sourced to expand. But how to make it something you could use for easy assigning and grading feels downright impossible. I guess this is where the whole collaboration between humanists and techies in the DR comes in? Gah auto correct. In the DH! Smarthistory (http://smarthistory.khanacademy.org/) has tons of free video and text-based content. Smarthistory at Khan Academy (https://www.khanacademy.org/humanities/art-history-basics) has an even more plus some assessment materials. This is my fourth year of being textbook-free in my intro art history classes and I can’t imagine going back to textbooks or subscription services with all of the free and open resources that are available today. When I’ve assigned the OER assessment tools, it was more for students to self-assess their learning of the on-line content, but I’d love to see a conversation/initiative about different ways instructors can use OERs like Smarthistory/KA to link with grading/requirements for class credit. Thanks Ginger! I would definitely *not* say KA lies outside the classroom context since it is used by tens of thousands of teachers! and millions of students in formal classroom settings. Khan Academy gives teachers tons of tools (there’s a teacher dashboard)- you can see what videos students have watched (even the number of minutes), and track their time on the site, and see what quizzes they have done etc. Of course each college also has a learning management system (LMS) —and there are dozens of these (Blackboard, etc.) so I think OERs (like Smarthistory at Khan Academy) integrating with any given college’s learning management system is just not going to happen (too many LMS’s). But I think we are asking too much – all you need to do is go to the teacher dashboard in KA, see what your students have done, and then go back to your college’s LMS. It’s not ideal, but there are many examples of separate databases that we all have to navigate (any college’s digital library will have dozens of separate databases for example). There is just no easy fix here, though I agree it would be nice! And the idea that we would ask students to pay a huge sum for a text book just so they can access my arts lab which then points them to free resources … well… there is a better way. Every Smarthistory at Khan Academy page has a set of curated links to excellent websites made by museums, scholars and not-for-profits. Perhaps we don’t do a very good job of getting the word out – but pretty much everything discussed here is possible on Khan Academy (true you can’t make a customized mini-site of just what you want your students to do or watch but its easy enough to make a syllabus of links that you put in your LMS, right?). I am so glad this topic is getting so much thoughtful comment and traction. My first comment on this thread gestured towards Smarthistory’s excellent resources in this area. However, Bath, you’re right. Teachers don’t know as much about these resources as they do about the rest of the amazing offerings on the SH site. I am particularly interested in your idea of creating a simple Excel sheet or similar that houses all of the links that one might want to send survey students to, calling them from the separate pages SH has them on. This is much like the syllabi that we have learned from your site and shared on ours here. I see two very easy action points. Would you and Steve be prepared to write a very short blog post that specifically highlights these resources? We would so love to share this on our site and get people talking even father about this topic. Secondly, I wonder if everyone who is taking an interest in this site would be equally as interested in crowdsourcing said collection of links. Perhaps at the end of a Beth and Steven post? What say you, all? And please forgive any typos. I’m typing frantically while on way to work! Honestly, I had never seen any of the quizzes for the smarthistory videos before; I just went to the smarthistory site and couldn’t find any of them, the only way I found them was using the links that Virginia posted above. So I think that might be part of the issue with people not knowing about this. Believe me, I really value the resources that smarthistory offers, and I make a lot of use of them for my upper-division courses (here’s the post I wrote last year: http://arthistoryteachingresources.org/2013/09/21/curating-a-virtual-textbook-for-early-20th-century-art-history/ ) I will definitely have to look into using Khan Academy next semester perhaps — I think maybe part of the issue is that the Khan Academy experience looks and feels very different from what you get when you go to smarthistory.org, and even when you go to the ‘teach with smarthistory” page, it isn’t clear that any sort of functionality comparable to myartslab is available. One of the issues I have had with using smarthistory for intro courses is that there hasn’t been an easy place to direct my students for a good big-picture overview of each unit of material, which seems to be resolved somewhat in the Khan Academy format, as there are text sections which help contextualize the videos. Something I prefer in MyArtsLab over smarthistory is the “Closer Look” features, which are somewhat like videos, but the text components help to organize the information for the students more effectively — it’s more like listening to a lecture with an outline in front of you, rather than just listening to a lecture, and you can backtrack to the exact spot where you need clarification. Another feature which is in MyArtsLab but not in KhanAcademy is the primary source texts and quizzes which build upon the content. Also, yes, MyArtsLab does link to some material on the web, but they have developed a lot of the material. So that’s my two cents. Thank you for your comments — they definitely opened my eyes to some new possibiities! There should soon be a new design on khanacademy.org that will help with navigation issues there – plus – there’s the brand-new Smarthistory.org – hopefully you will find that easier to use (though no quizzes there). One of the problems finding the quizzes on Khan Academy is that there are 100 of them or so mixed in with 2000 or so pieces of content. So I would suggest searching on Khanacademy for the works of art you are teaching and seeing if there is a quiz for it. Thanks Michelle, Steven and I would be happy to write a post about the resources provided on Khan Academy. And Marie, I’m not surprised you didn’t know about the quizzes since we only added them in the last year. We are moving everything on smarthistory over to Khan Academy (most things are already there, but there are about 200-300 essays that need to be moved over). Eventually, probably by the end of 2014, we will retire Smarthistory.org. We agree a text intro is important for each topic area – and we hope more art historians will contribute their expertise and write one in their area. The functionality of an outline in the videos so students can go to a specific spot does indeed sound useful. Keep in mind that videos on Khan Academy have interactive transcripts so students can read those over and re-watch the part that they need (this is in the options menu under the video). Students can also listen to the video at a faster speed if they want. We’d be happy to include more primary source texts. If you have suggestions for what to include please send them our way! And while we’re on the subject of things folks may not be aware of, check out our images on Flickr – totally free for teaching art history. Beth, we’d be thrilled to post anything that you and Steve send us on this topic, and as our new site and lesson plans debut next month, will also link to the quizzes and other SH resources. Hopefully a post will direct more teachers to become aware of and use your great resources. Will wait to hear from you. I would like to know if this is applied for NYC students. We need lot of help to introduce inner City students and their needs in arena of art and their own history.